All's Well That Ends Well is a play by William Shakespeare, published in the First Folio in 1623, where it is listed among the comedies. There is a debate regarding the dating of the composition of the play, possible dates range from 1598 to 1608. The play is considered one of Shakespeare’s "problem plays"; a play that poses complex ethical dilemmas that require more than typically simple solutions. 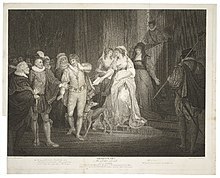 A lithograph depicting Act IV Scene III. 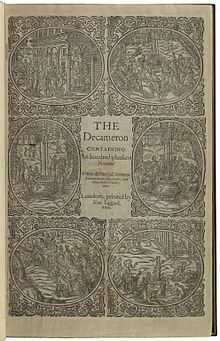 The play is based on a tale (tale nine of day three) of Boccaccio's The Decameron. Shakespeare may have read an English translation of the tale in William Painter's Palace of Pleasure. ^ a b Maguire, Laurie; Smith, Emma (19 April 2012). "Many Hands – A New Shakespeare Collaboration?". The Times Literary Supplement. also at Centre for Early Modern Studies, University of Oxford accessed 22 April 2012: "The recent redating of All’s Well from 1602–03 to 1606–07 (or later) has gone some way to resolving some of the play’s stylistic anomalies" ... "[S]tylistically it is striking how many of the widely acknowledged textual and tonal problems of All’s Well can be understood differently when we postulate dual authorship." ^ Taylor, Paul (18 January 2018). "All's Well That Ends Well, review: Eye-opening and vividly alive". The Independent. ^ Hadfield, Andrew (August 2017). "Bad Faith". Globe: 48–53. ISSN 2398-9483. ^ Kellaway, Kate (14 December 2003). "Judi...and the beast". The Observer. UK. Retrieved 5 July 2009. ^ a b Genest, John (1832). Some account of the English stage: from the Restoration in 1660 to 1830. 3. Bath, England: Carrington. pp. 645–647. ^ Highfill, Philip (1984). A biographical dictionary of actors, actresses, musicians, dancers, managers and other stage personnel in London, 1660–1800. 10. Carbondale, IL: Southern Illinois University Press. p. 262. ISBN 978-0-8093-1130-9.